It's been a while since I've switched up my hair care routine so I jumped at the opportunity to try out some Pura D'Or products. I decided to try their hair loss prevention shampoo and argan oil for face, body, and hair since my hair and skin has been feeling horrible from the bipolar weather we've been having lately. Plus both products are organic and cruelty-free so why not try something that's going to be better than what I'm buying at the drugstore? First up is the hair loss prevention shampoo which contains argan oil in it and has a pump which makes it so much easier to use in the shower. 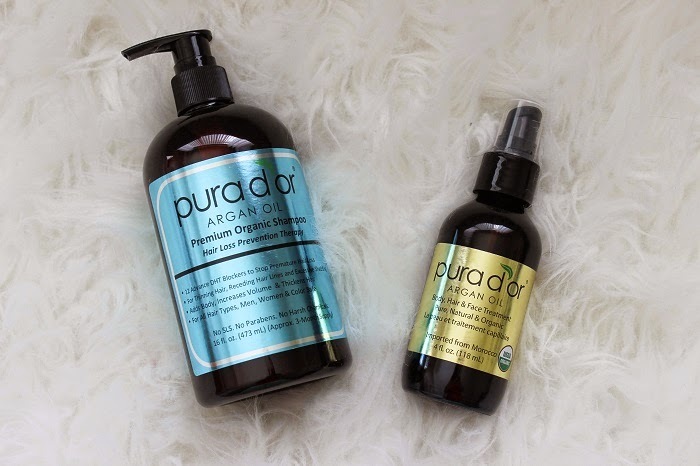 Pura D'Or claims that the shampoo will prevent hair loss, strengthen damaged hair, has 12 DHT blockers, and is paraben, SLS, and gluten free! Whoa, tons of benefits! The first thing I noticed is that it has a very natural, clean smell almost like freshly cut grass! It was a refreshing surprise compared to the fruity or chemical smells that I always expect from shampoos. Once washed and dried, I noticed from the first time that I used it that it didn't dry out my hair like most shampoos do. Must be the argan oil! My hair looked healthy and seemed to have even had a bit of volume in it to give off a fuller effect. I was also surprised to notice that I didn't lose as much hair in the shower as I normally do! No matter how many shampoos I've tried in the past couple years, that never happens! After I blow-dryed my hair straight, I decided to use the argan oil on the ends of my hair to give it a bit of shine. The argan oil also has a pump on it which I love and it didn't feel greasy on my hands or hair. Mind you, always use a small amount of oil because this stuff is pretty strong! Then I used some argan oil on my face as a moisturizer (which didn't make me break out!) and on dry patches of skin and it completely absorbed in seconds, leaving no residue. Overall, so far I'm impressed with these products and I'm defiantly going to be using it regularly in order to see a difference in my hair and skin!